Bourbon Street Books, 9780062348890, 432pp. In this electrifying sequel to the crowd-pleasing thriller Angel Killer, magician-turned-FBI agent Jessica Blackwood must once again draw on her past to go up against a brutal murderer desperate for revenge at any price. 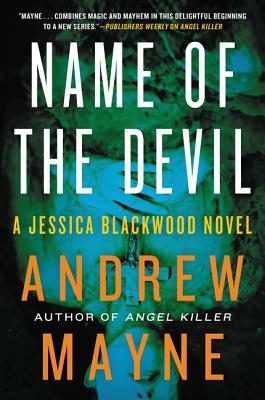 After playing a pivotal role in the capture of the Warlock, a seemingly supernatural serial killer—and saving the FBI’s reputation in the process—agent Jessica Blackwood can no longer ignore the world she left behind. Formerly a prodigy in a family dynasty of illusionists, her talent and experience endow her with a unique understanding of the power and potential of deception, as well as a knack for knowing when things are not always as they appear to be. When a church congregation vanishes under mysterious circumstances in rural Appalachia, the bizarre trail of carnage indicates the Devil’s hand at work. But Satan can’t be the suspect, so FBI consultant Dr. Ailes and Jessica’s boss on the Warlock case, Agent Knoll, turn to the ace up their sleeve: Jessica. She’s convinced that an old cassette tape holds the key to the mystery, and unraveling the recorded events reveals a troubling act with far-reaching implications. The evil at work is human, and Jessica must follow the trail from West Virginia to Mexico, Miami, and even the hallowed halls of the Vatican. Can she stop a cold-blooded killer obsessed by a mortal sin—or will she become the next target in a twisted, diabolical game of hunter and prey…? Andrew Mayne started his first illusion tour while he was a teenager and was soon headlining in resorts and casinos around the world. He’s worked behind the scenes creatively for David Copperfield, Penn & Teller, and David Blaine. With the support of talk show host and amateur magician Johnny Carson, Andrew started a program to use magic to teach critical thinking skills in public schools for the James Randi Educational Foundation. Andrew’s “Wizard School” segments, teaching magic and science to children, aired nationwide on public television. He also starred in the reality show Don’t Trust Andrew Mayne.